Check Out a Sneak Peak of our Upcoming Episode of The American Rancher! A common question our dealers, Area Sales Managers and nutritionists receive is what product should I feed after Concept•Aid®? VitaFerm® HEAT is a logical next step for producers who are concerned about heat stress and insect control. 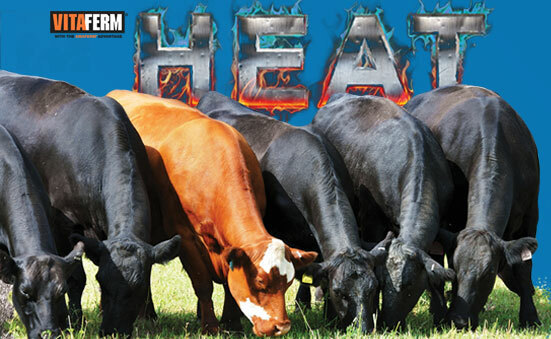 VitaFerm HEAT is a vitamin and mineral supplement used to reduce heat stress during warm seasons of 70 degrees and above, especially in fescue pastures. VitaFerm HEAT contains Amaferm® and Capsaicin, research proven to lower body temperature, which can help improve conception rates and maintain pregnancy. It also includes garlic, a natural insect repellent. Ideal summer mineral because it helps combat the negative effects of heat stress and fescue grasses. Contains organic copper, zinc and manganese to support reproduction, immunity and hoof quality. Contains Capsaicin, a unique combination of added extracts to help maintain circulation to support animal performance in both heat and fescue situations. Capsaicin is research proven to lower body temperature, which can help improve conception rates and maintain pregnancy. Also includes garlic, a natural insect repellent. Amaferm is a natural feed additive that acts as a prebiotic increasing digestibility to maximize the energy value of feed. It is research proven to maintain performance during heat stress. Amaferm supports the beneficial microbial population and fiber digestion that is often limited in fescue. VitaFerm Heat CTC 3G provides FDA approved level of Aureomycin® for control of Anaplasmosis that can severely impact reproductive performance within infected herds.